Thank you for visiting our site today to learn more about our video tape conversion and streaming video encoding services. Selecting the right streaming video producer saves money, time and yields better results. So whether your objective is to save money, save time, have higher quality streaming video on your site, or gain technical expertise, we hope you'll review our own video presentations to learn why we're chosen by more companies than anyone else. We invite you to watch some of sample videos we've done for our customers. If you're on a lower bandwidth connection at this time, alternate sample clips are available by following any of the links on our navigation bar to the left which are followed by this movie symbol: We would recommend that you begin by watching the sample video clips contained on our customer sample page. Exceeding your expectations by providing you with high quality encoding and prompt, professional customer service is our main objective, so please call us at 630-690-2141 if we can answer any questions. 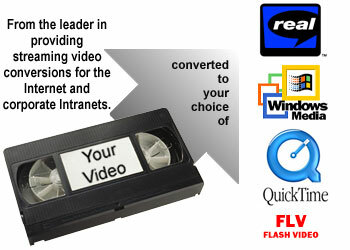 We provide web video encoding services to customers anywhere in the U.S. or around the world.